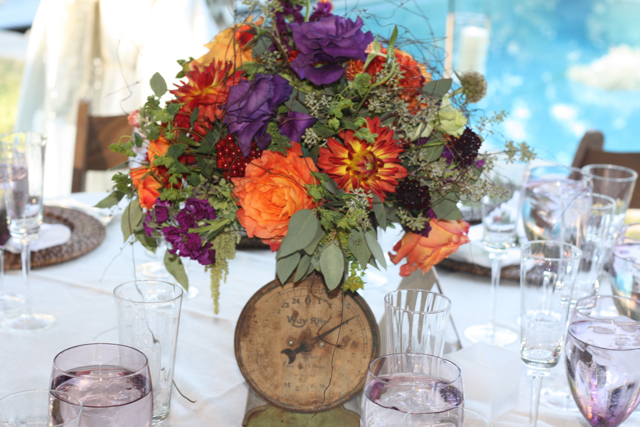 If you missed yesterdays post, back up, and get acclimated, because I am onto the reception decor. 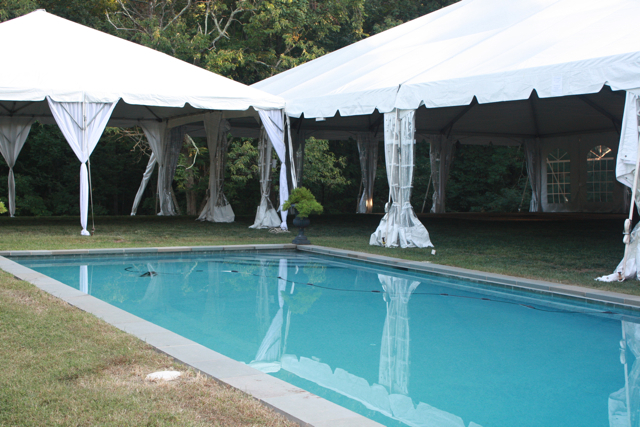 The amazing wedding of Mackenzie and Adam progressed to this fabulous tent area, that was designed next to the pool. 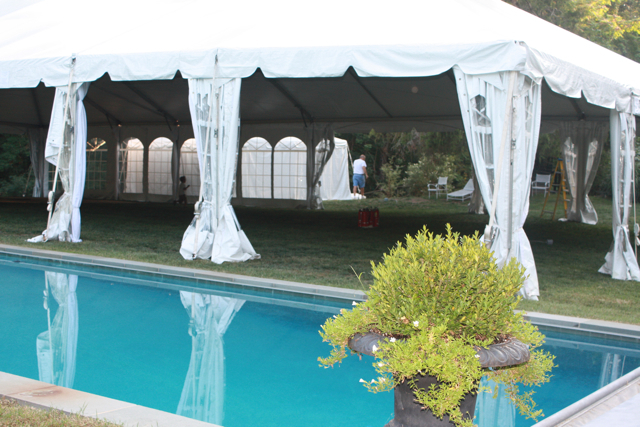 The tent was constructed at the venue on Wens. My incredibly capable husband spent the better part of Wens. night at the venue wiring the tent with electricity. We as a team learned so much about just what it takes to make everything work for an event of this size. 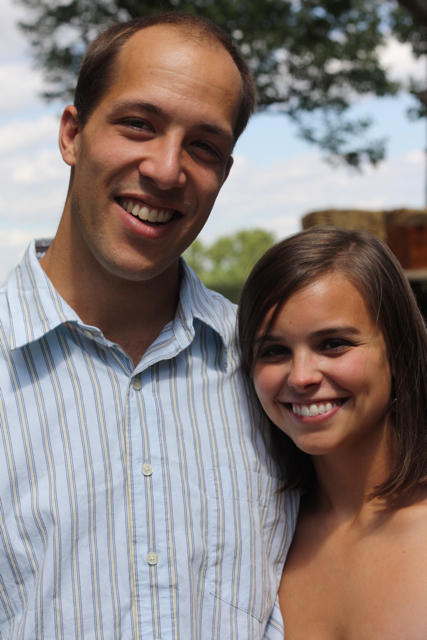 Lucky for me, Evan was once a master electrician and he has always handled all construction projects for our family. I knew he would be able to master this tent, and of course he did perfectly. In this picture if you look very closely you can see our 4 year old Sam in the middle of the tent, Evan is also in the picture pulling wire. 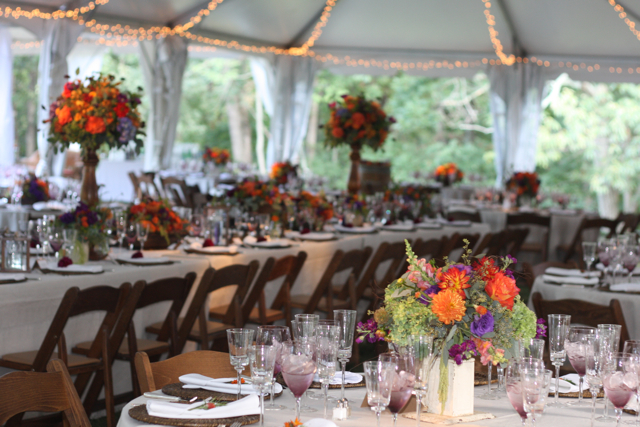 Not only did we manage this event, and provide all decor, Evan wired the tent for the D.J., the caterers, and the lighting company. Evan was also hired to do the pin spotting by the family. The lighting company we were working with was booked solid for this holiday weekend. The best they could do was provide the lights on Thursday but we would need someone to actually set the pin spots on the floral designs the day of the wedding. Evan took on that task as well. I know, he is awesome!! On Thursday we managed the arrival of the portable restrooms and Friday we helped the rental company with placement of chairs, china, linens, and furniture. We had ceremony chairs, reception chairs, tables, lounge furniture, plus all of the furniture I brought in from my booth at On A Whim Antiques. Oh, we also rented wine barrels from Fabbioli Wine in Lucketts. We used the wine barrels to create an unique cake table and a candy bar. A friend of the brides family created tabletops for the barrels. 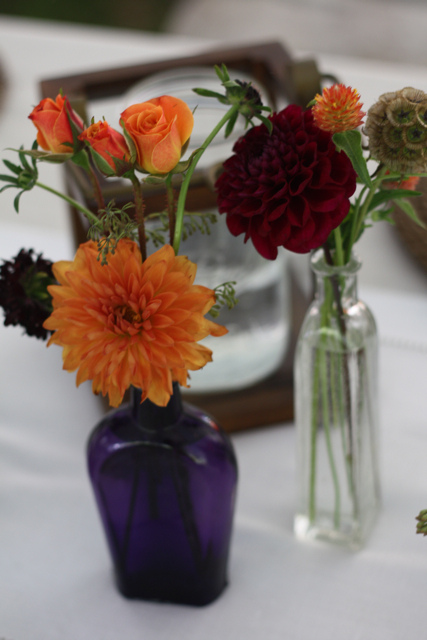 In addition to our flower order we at Holly Heider Chapple Flowers LTD. were paid a fee to style the event. This meant I could come up with some really clever and unique pieces to make this wedding special and also truly put my stamp on this event as a designer. Evan got literally roped into bringing my first vision to life. 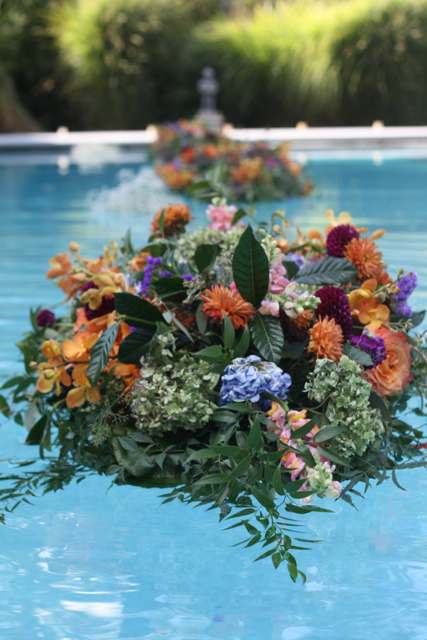 I decided that I wanted flower arrangements floating in the pool. The designs not only had to float but they also needed to provide candlelight when it became dark. Here is a great shot of Evan trying to anchor my pieces into place. My daughter Hannah actually climbed into the pool to get this photograph. In fact Hannah took almost all of these photographs for me. 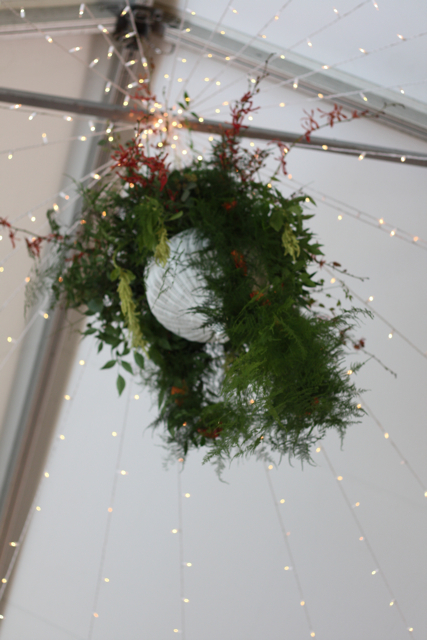 Evan's next mission was to hang a floral design from the center of the tent. 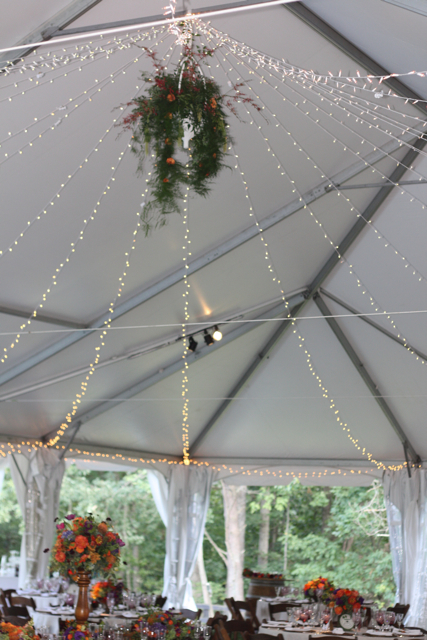 We had a canopy of twinkly lights in the tent, and they swirled up to a center spot. On my last furniture run to On A Whim I spotted this white wicker basket across the room and I had it in my hands in 3 seconds flat. I knew instantly upon seeing the basket, it would make the best center, centerpiece. 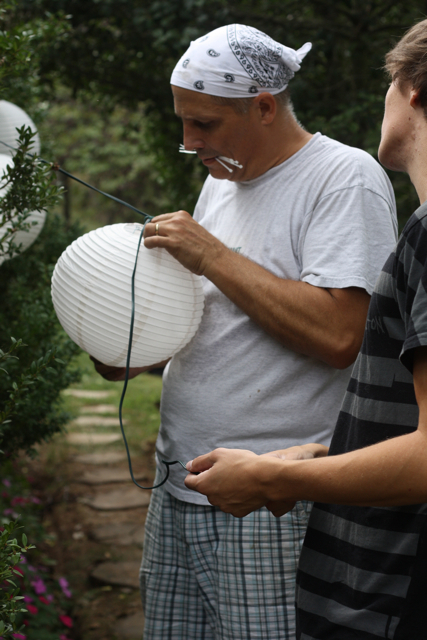 Evan also put up lights for the owner of the mansion and actually did an emergency plumbing job in the mansion house. Yes, we could say Evan was worth his weight in gold this past weekend and I am so grateful he was with me on this job. 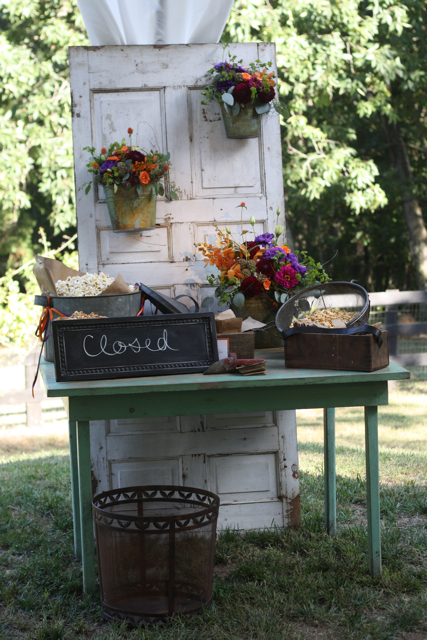 My next really fun surprise for the bride and her family was super cute kettle popcorn stand. 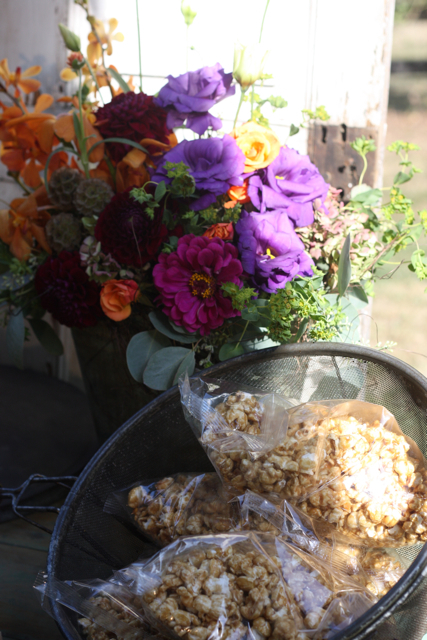 I used vintage crocks, kettles, and even our antique strainer to hold the popcorn. 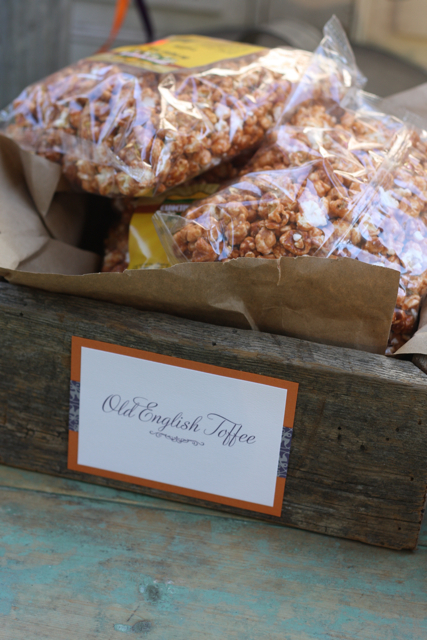 The large kettle had plain popcorn, we also had toffee, caramel, and peanut butter flavored popcorn. Paperzest made me cards for each flavor. 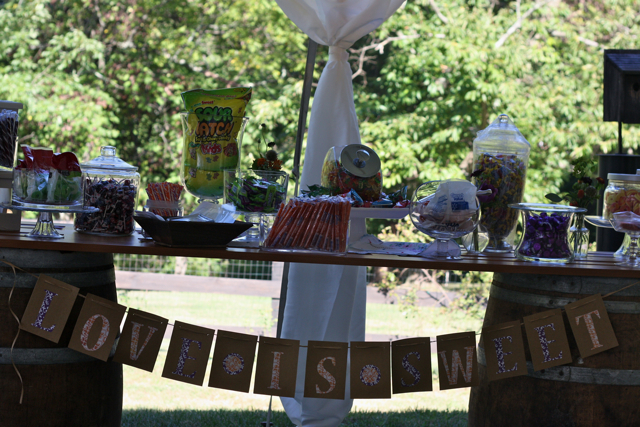 The family had designed a candy bar and I thought this was a fun addition to this sweet area in the tent. The door and the table were from On A Whim Antiques. It just so happens that my dad sells kettle corn at his farmers market called Heiders Country Store. I know my resources are ridiculous. 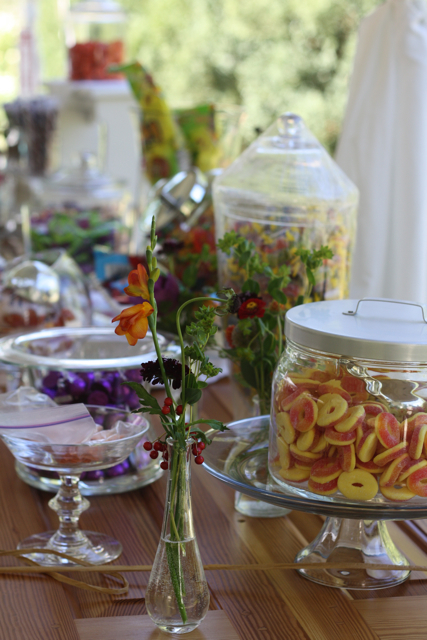 The candy bar was designed by the family. 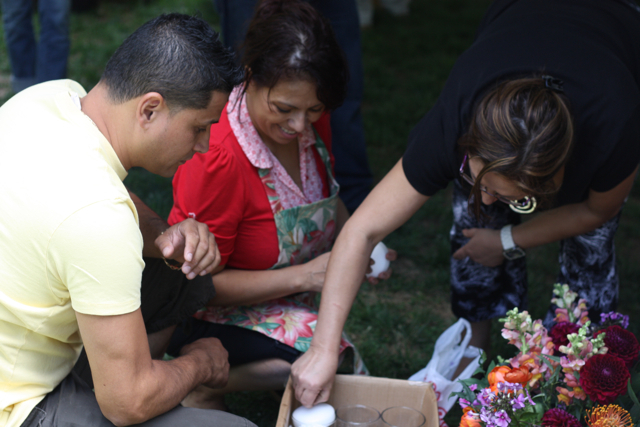 They used several of my containers and I came behind them with flowers and decor. 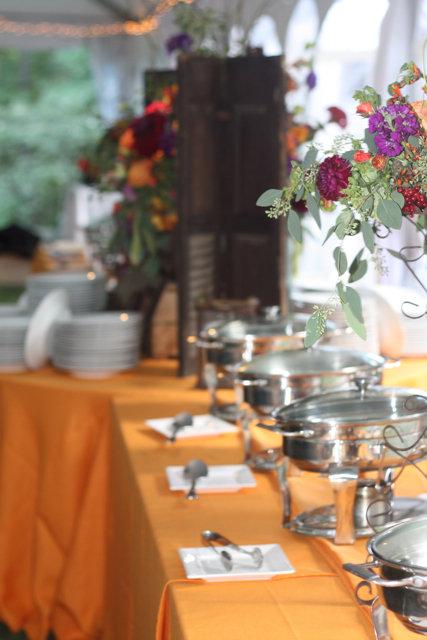 The reception tables, well they were just divine. 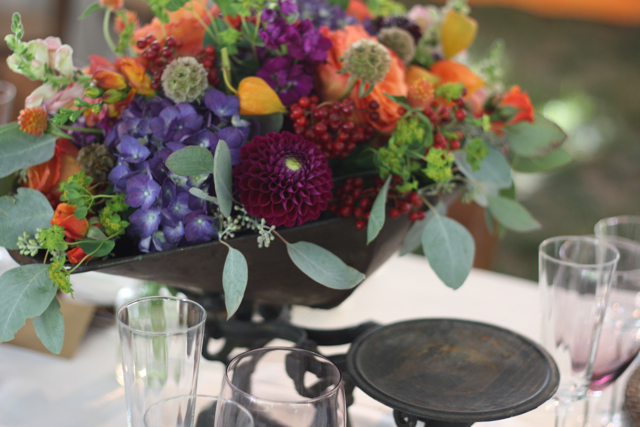 I used vintage crocks, antique scales, and wooden boxes that were made by my brides grandfather. Grandpa's wooden boxes were just amazing to design in, and I just kept thinking how proud he must have been to see his boxes at his granddaughters wedding. I love the linens, love the chargers, love the glass, and china, and of course I love my flowers. 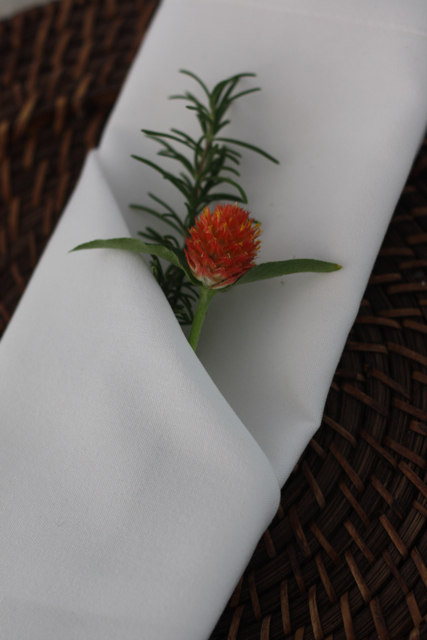 Every guest napkin had a treatment of rosemary and orange globe amaranth. 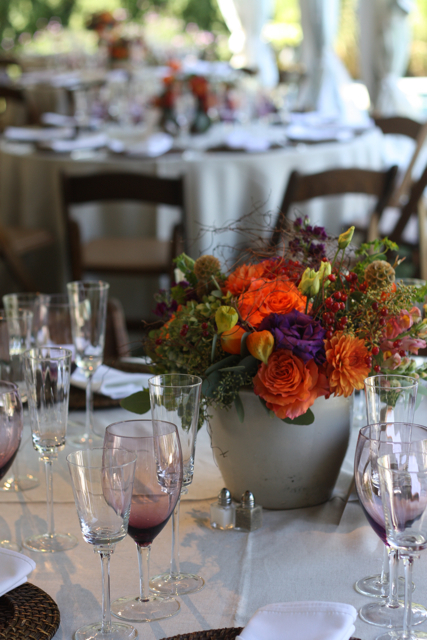 We had 17 round guest tables and these surrounded a 20 person oblong head table. 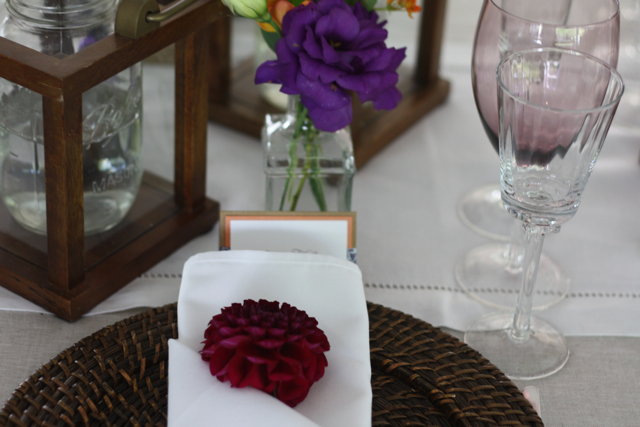 We placed a purple dahlia in the napkins at the head table. Over the winter, I found this rustic vintage scale. I knew the moment I saw it, it would be used on something very special, I could see its future and perhaps mine. 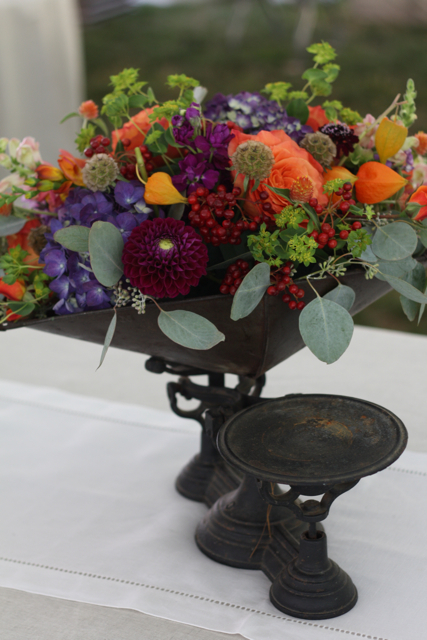 The scale has an awesome bowl and I was dying to create an arrangement in the container. When I did my first consult with Mackenzie and her mom we all became enthralled with using this scale as an inspiration for the look of the wedding. 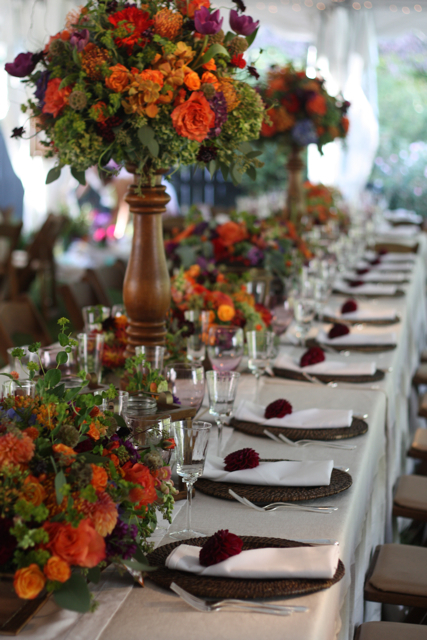 The scale became the center design on the head table and it was placed right in front of the bride and groom. The head table also featured two elevated designs, lanterns, vintage bottles and the wooden boxes made by the grandfather. The head table was truly a masterpiece. 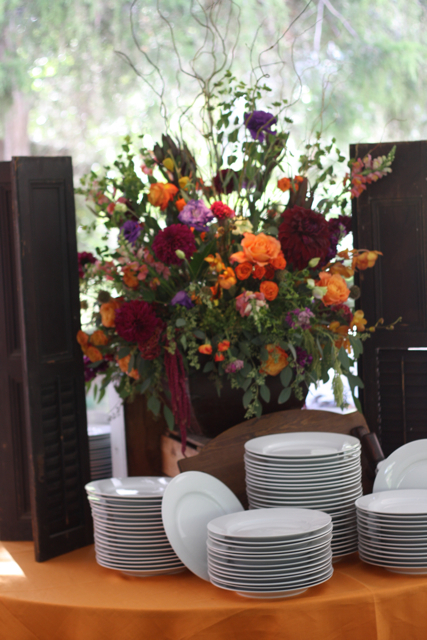 We decorated the buffet with old shutters and fabulous florals in either huge tins or wooden baskets. I even brought old crocks for my friends at Celebrations Catering to use. This gave the buffet a really fabulous look and I was really happy that I thought to provide those, until I had to take them home dirty. The horseradish sauce certainly smelled lovely, but cleaning the crocks was not so cool. Now about the food, and catering, I love Douglas and the staff of Celebrations Catering. 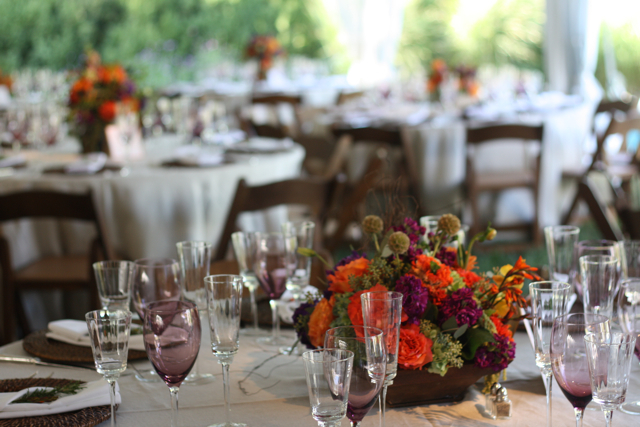 Many thanks to Douglas who put up with my crazy ideas and helped me to execute the look of this wedding flawlessly. Douglas and his team have always been so supportive of me, and my vision, and I am thankful that they were with me on this effort. Thanks to my staff and family, a total of 19 people helped to make this weekend work. 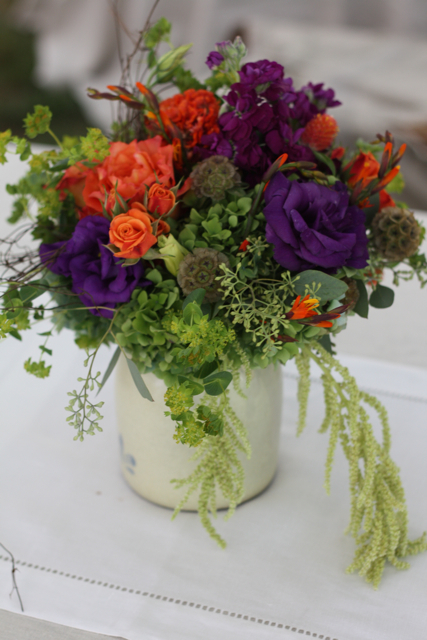 In addition to this wedding we provided flowers at The Belmont Country Club, Whitehall Manor, The Strathmore Music Center, and Raspberry Plains. My only regret is that I was not able to get to my other weddings, but I made every single bridal bouquet and approved every single design. In spite of a very busy weekend, I did not let anything leave our studio that could not proudly be called a Holly Chapple Design. There are times that I think my standards are simply ridiculous, but in truth, I would not want any of my brides to receive anything less than the love, and attention, that goes into our work. There were so many fabulous other things about this wedding that I am dying to share, like our killer farm table bar, our old vintage washstand that held the drinks at the bar, and our really cute lounge, but we will have to leave those pictures up to photographer Genevieve Leiper. I seemed to miss those shots. Thanks for hanging with me on this post, I know it was a whopper, but it was a baby I was dying to share. We are event designers!! Many thanks to this remarkable family for having faith in me, and for allowing me to be a part of your big day. 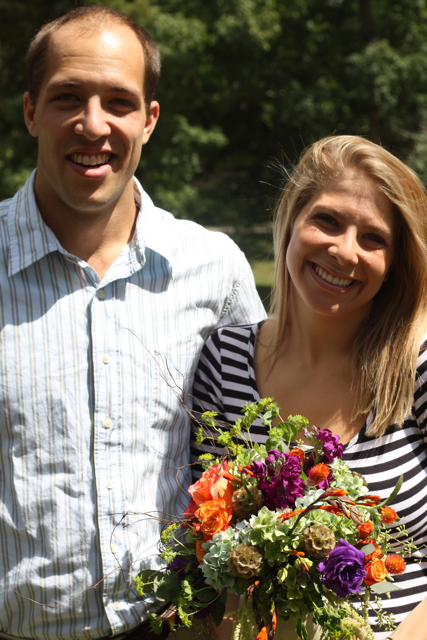 Happy married life Mackenzie and Adam, we loved doing your wedding flowers, and your event design! You never cease to amaze me!!! Your work is truly an art and I wish that I was getting married again! Love everything. Woo hoo – Congrats Holly!! !